Vision is the most important sense for any animal, and especially for birds. Good eyesight is essential for safe flight, and this group has a number of adaptations which give visual acuity superior to that of other vertebrate groups. 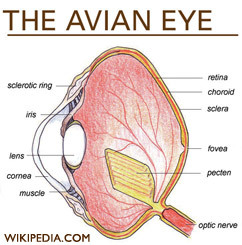 The avian eye resembles that of a reptile, with ciliary muscles that can change the shape of the lens rapidly and to a greater extent than in the mammals. Birds have the largest eyes relative to their size in the animal kingdom. In addition to the two eyelids usually found in vertebrates, it is protected by a third transparent movable membrane. The eye’s internal anatomy is similar to that of other vertebrates, but has a structure, the pecten oculi, unique to birds. Some bird groups have specific modifications to their visual system linked to their way of life. 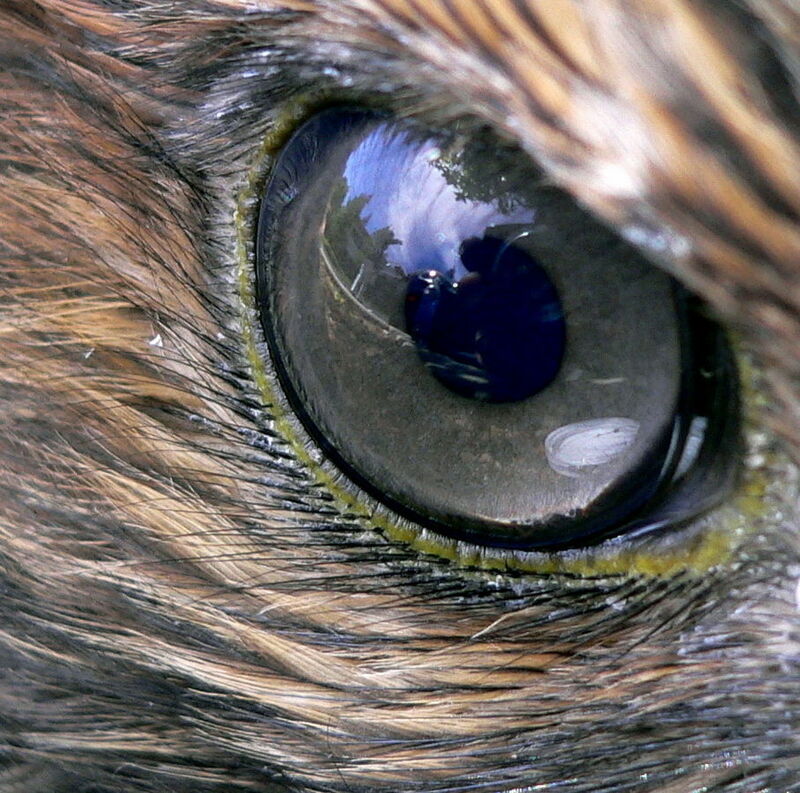 Birds of prey have a very high density of receptors and other adaptations that maximise visual acuity. The placement of their eyes gives them good binocular vision enabling accurate judgement of distances. Nocturnal species have tubular eyes, low numbers of colour detectors, but a high density of rod cells which function well in poor light. Terns, gulls and albatrosses are amongst the seabirds which have red or yellow oil droplets in the colour receptors to improve distance vision especially in hazy conditions. Are eyes of birds superior to human eyes? The retina is a relatively smooth curved multi-layered structure containing the photosensitive rod and cone cells with the associated neurons and blood vessels. The density of the photoreceptors is critical in determining the maximum attainable visual acuity. Humans have about 200,000 receptors per mm2 ( Average peak cone density near the fovea is 164,000±24,000 cones/mm2 ) but the house sparrow has 400,000 and the common buzzard 1,000,000. The result is better visual resolution. For example, an American kestrel can see a 2–mm insect from the top of an 18–m tree. The photoreceptors are not all individually connected to the optic nerve, and the ratio of nerve ganglia to receptors is important in determining resolution. This is very high for birds; the white wagtail has 100,000 ganglion cells to 120,000 photoreceptors. 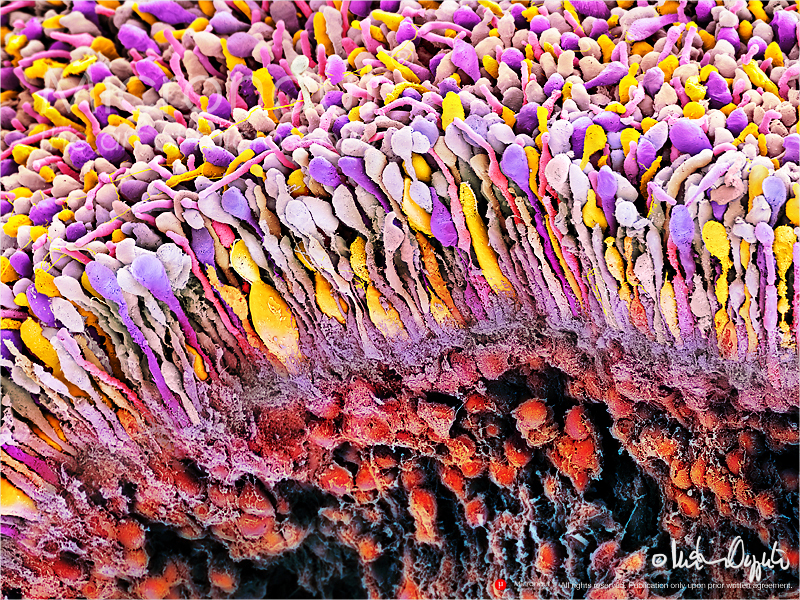 The human retina consists of more than 100 million receptor cells. They are adapted to differen wavelengths of light (red, blue, green), motion, and darkness or dark areas. Additionally, some are sensitive to “light on” and others to “light off”. Similar to a camera with 10-15 different films. A true masterpiece of evolution! Birds can resolve rapid movements better than humans, for whom flickering at a rate greater than 50 light pulse cycles per second appears as continuous movement. Humans cannot therefore distinguish individual flashes of a fluorescent light bulb oscillating at 60 light pulse cycles per second, but budgerigars and chickens have flicker or light pulse cycles per second thresholds of more than 100 light pulse cycles per second. A Cooper’s hawk can pursue agile prey through woodland and avoid branches and other objects at high speed; to humans such a chase would appear as a blur. The eye of a bird most closely resembles that of the reptiles. Unlike the mammalian eye, it is not spherical, and the flatter shape enables more of its visual field to be in focus. A circle of bony plates, the sclerotic ring, surrounds the eye and holds it rigid, but an improvement over the reptilian eye, also found in mammals, is that the lens is pushed further forward, increasing the size of the image on the retina. Most birds cannot move their eyes, although there are exceptions, such as the great cormorant. Birds with eyes on the sides of their heads have a wide visual field, useful for detecting predators, while those with eyes on the front of their heads, such as owls, have binocular vision and can estimate distances when hunting. The American woodcock probably has the largest visual field of any bird, 360° in the horizontal plane, and 180° in the vertical plane. The eyelids of a bird are not used in blinking. Instead the eye is lubricated by the nictitating membrane, a third concealed eyelid that sweeps horizontally across the eye like a windscreen wiper. The nictitating membrane also covers the eye and acts as a contact lens in many aquatic birds when they are under water. 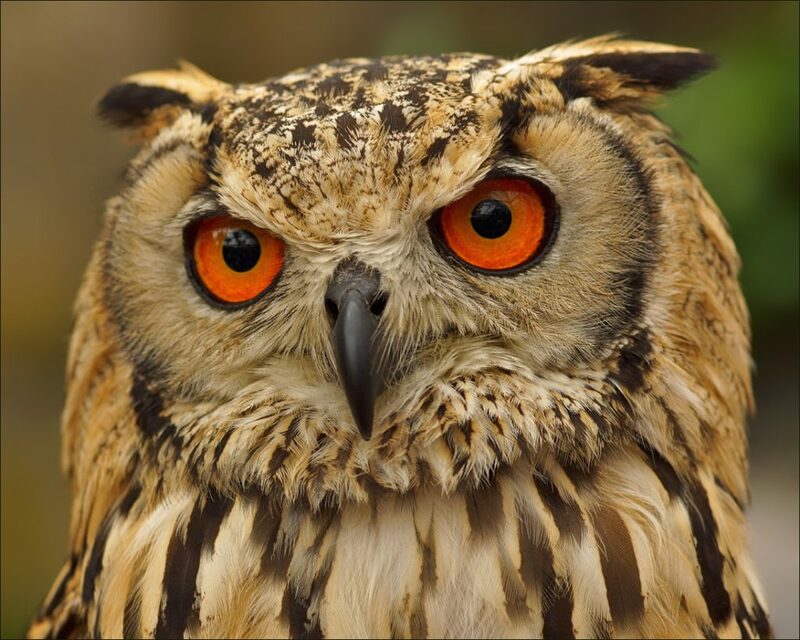 When sleeping, the lower eyelid rises to cover the eye in most birds, with the exception of the horned owls where the upper eyelid is mobile. The eye is also cleaned by tear secretions from the lachrymal gland and protected by an oily substance from the Harderian glands which coats the cornea and prevents dryness. The eye of a bird is larger compared to the size of the animal than for any other group of animals, although much of it is concealed in its skull. 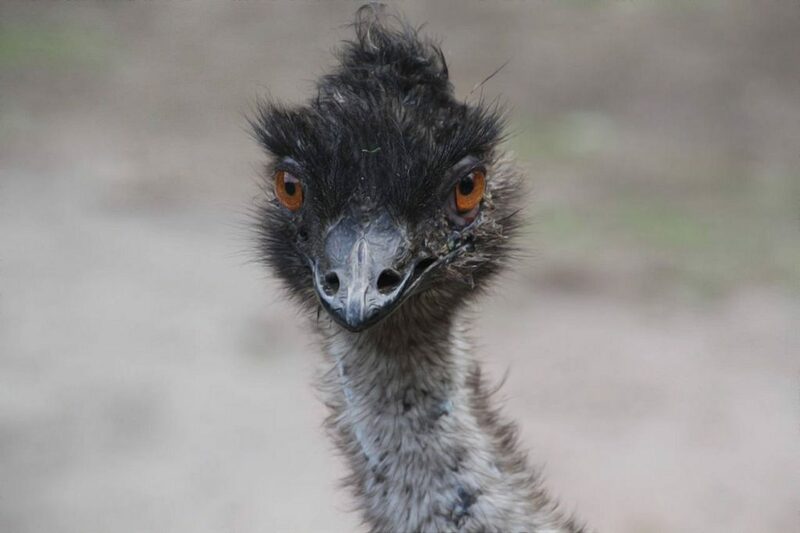 The ostrich has the largest eye of any land vertebrate, with an axial length of 50 mm (2 in), twice that of the human eye. Bird eye size is broadly related to body mass. A study of five orders (parrots, pigeons, petrels, raptors and owls) showed that eye mass is proportional to body mass, but as expected from their habits and visual ecology, raptors and owls have relatively large eyes for their body mass. 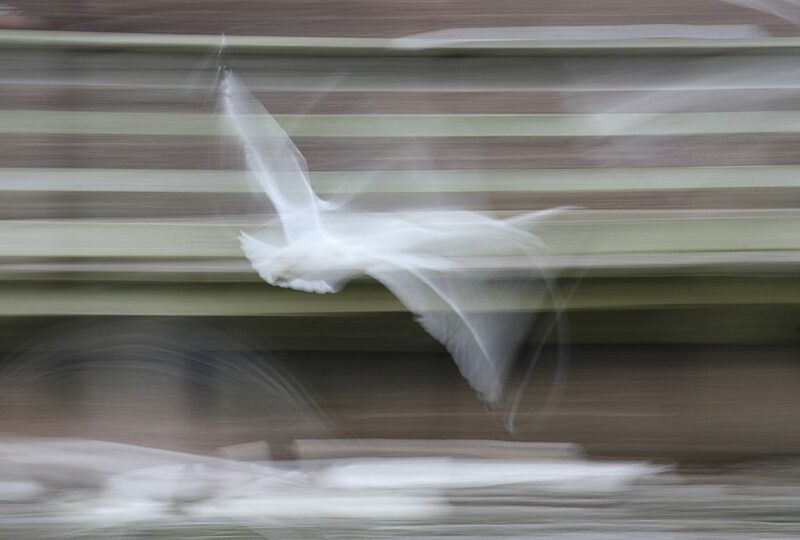 Behavioural studies show that many avian species focus on distant objects preferentially with their lateral and monocular field of vision, and birds will orientate themselves sideways to maximise visual resolution. For a pigeon, resolution is twice as good with sideways monocular vision than forward binocular vision, whereas for humans the converse is true. The performance of the eye in low light levels depends on the distance between the lens and the retina, and small birds are effectively forced to be diurnal because their eyes are not large enough to give adequate night vision. Although many species migrate at night, they often collide with even brightly lit objects like lighthouses or oil platforms. Birds of prey are diurnal because, although their eyes are large, they are optimised to give maximum spatial resolution rather than light gathering, so they also do not function well in poor light. Many birds have an asymmetry in the eye’s structure which enables them to keep the horizon and a significant part of the ground in focus simultaneously. The cost of this adaptation is that they have myopia in the lower part of their visual field. Nocturnal birds have eyes optimised for visual sensitivity, with large corneas relative to the eye’s length, whereas diurnal birds have longer eyes relative to the corneal diameter to give greater visual acuity. Information about the activities of extinct species can be deduced from measurements of the sclerotic ring and orbit depth. For the latter measurement to be made, the fossil must have retained its three-dimensional shape, so activity pattern cannot be determined with confidence from flattened specimens like Archaeopteryx, which has a complete sclerotic ring but no orbit depth measurement. The main structures of the bird eye are similar to those of other vertebrates. The retina is a relatively smooth curved multi-layered structure containing the photosensitive rod and cone cells with the associated neurons and blood vessels. The density of the photoreceptors is critical in determining the maximum attainable visual acuity. Humans have about 200,000 receptors per mm2, but the house sparrow has 400,000 and the common buzzard 1,000,000. The photoreceptors are not all individually connected to the optic nerve, and the ratio of nerve ganglia to receptors is important in determining resolution. This is very high for birds; the white wagtail has 100,000 ganglion cells to 120,000 photoreceptors. Rods are more sensitive to light, but give no colour information, whereas the less sensitive cones enable colour vision. In diurnal birds, 80% of the receptors may be cones (90% in some swifts) whereas nocturnal owls have almost all rods. As with other vertebrates except placental mammals, some of the cones may be double cones. These can amount to 50% of all cones in some species. Towards the centre of the retina is the fovea (or the less specialised, area centralis) which has a greater density of receptors and is the area of greatest forward visual acuity, i.e. sharpest, clearest detection of objects. In 54% of birds, including birds of prey, kingfishers, hummingbirds and swallows, there is second fovea for enhanced sideways viewing. The optic nerve is a bundle of nerve fibres which carry messages from the eye to the relevant parts of the brain and vice versa. Like mammals, birds have a small blind spot without photoreceptors at the optic disc, under which the optic nerve and blood vessels join the eye. Five cone types, arranged in near-uniform mosaics, provide phenomenal color resolution. The pecten is a poorly understood body consisting of folded tissue which projects from the retina. It is well supplied with blood vessels and appears to keep the retina supplied with nutrients, and may also shade the retina from dazzling light or aid in detecting moving objects. Pecten oculi is abundantly filled with melanin granules which have been proposed to absorb stray light entering the bird eye to reduce background glare. In the vertebrate eye, blood vessels lie in front of the retina, partially obscuring the image. The pecten helps to solve this problem by greatly reducing the number of blood vessels in the retina and leading to the extremely sharp eyesight of birds such as hawks. The pigmentation of the pecten is believed to protect the blood vessels against damage from ultraviolet light. Stray-light absorption by melanin granules of pecten oculi is also considered to give rise to small increments in temperature of pecten and eye; this may offer increased metabolic rate to optimize eye physiology in low temperatures at high-altitude flights. The structure varies across bird species and is conical in the kiwi, vaned in the ostrich and pleated in most other birds. There are two sorts of light receptors in a bird’s eye, rods and cones. Rods, which contain the visual pigment rhodopsin are better for night vision because they are sensitive to small quantities of light. Cones detect specific colours (or wavelengths) of light, so they are more important to colour-orientated animals such as birds. Most birds are tetrachromatic, possessing four types of cone cells each with a distinctive maximal absorption peak. In some birds, the maximal absorption peak of the cone cell responsible for the shortest wavelength extends to the ultraviolet (UV) range, making them UV-sensitive. In addition to that, the cones at bird’s retina are arranged in a characteristic form of spatial distribution, known as hyperuniform distribution, which maximizes its light and color absorption. This form of spatial distributions are only observed as a result of some optimization process, which in this case can be described in terms of bird’s evolutionary history. By far the most abundant cone pigment in every bird species examined is the long-wavelength form of iodopsin, which absorbs at wavelengths near 570 nm. This is roughly the spectral region occupied by the red- and green-sensitive pigments in the primate retina, and this visual pigment dominates the colour sensitivity of birds. In penguins, this pigment appears to have shifted its absorption peak to 543 nm, presumably an adaptation to a blue aquatic environment. The information conveyed by a single cone is limited: by itself, the cell cannot tell the brain which wavelength of light caused its excitation. A visual pigment may absorb two wavelengths equally, but even though their photons are of different energies, the cone cannot tell them apart, because they both cause the retinal to change shape and thus trigger the same impulse. 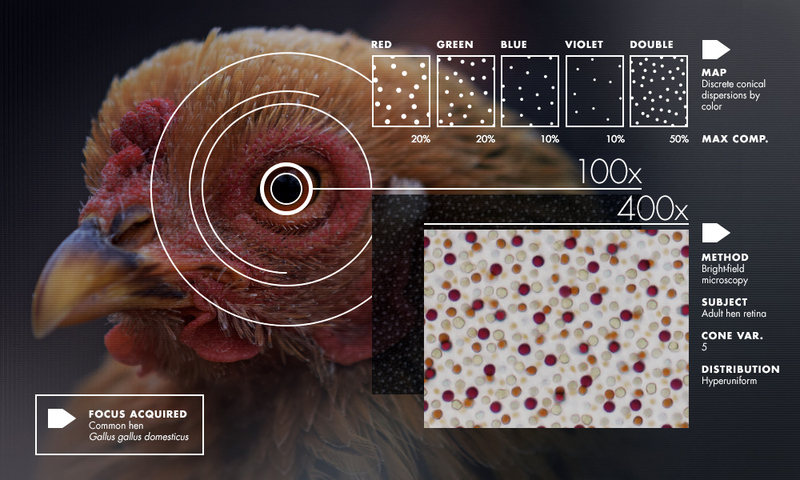 For the brain to see colour, it must compare the responses of two or more classes of cones containing different visual pigments, so the four pigments in birds give increased discrimination. Each cone of a bird or reptile contains a coloured oil droplet; these no longer exist in mammals. The droplets, which contain high concentrations of carotenoids, are placed so that light passes through them before reaching the visual pigment. They act as filters, removing some wavelengths and narrowing the absorption spectra of the pigments. This reduces the response overlap between pigments and increases the number of colours that a bird can discern. Six types of cone oil droplets have been identified; five of these have carotenoid mixtures that absorb at different wavelengths and intensities, and the sixth type has no pigments. The cone pigments with the lowest maximal absorption peak, including those that are UV-sensitive, possess the ‘clear’ or ‘transparent’ type of oil droplets with little spectral tuning effect. The colours and distributions of retinal oil droplets vary considerably among species, and is more dependent on the ecological niche utilised (hunter, fisher, herbivore) than genetic relationships. As examples, diurnal hunters like the barn swallow and birds of prey have few coloured droplets, whereas the surface fishing common tern has a large number of red and yellow droplets in the dorsal retina. The evidence suggests that oil droplets respond to natural selection faster than the cone’s visual pigments. Even within the range of wavelengths that are visible to humans, passerine birds can detect colour differences that humans do not register. This finer discrimination, together with the ability to see ultraviolet light, means that many species show sexual dichromatism that is visible to birds but not humans. Migratory songbirds use the Earth’s magnetic field, stars, the Sun, and other unknown cues to determine their migratory direction. An American study suggested that migratory Savannah sparrows used polarised light from an area of sky near the horizon to recalibrate their magnetic navigation system at both sunrise and sunset. This suggested that skylight polarisation patterns are the primary calibration reference for all migratory songbirds. However, it appears that birds may be responding to secondary indicators of the angle of polarisation, and may not be actually capable of directly detecting polarisation direction in the absence of these cues. 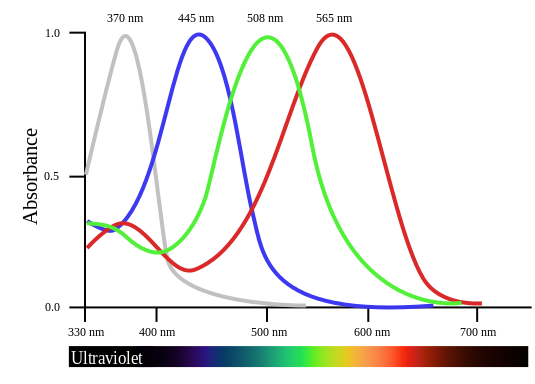 While tetrachromatic vision is not exclusive to birds (insects, reptiles, and crustaceans are also sensitive to short wavelengths), some predators of UVS birds cannot see ultraviolet light. This raises the possibility that ultraviolet vision gives birds a channel in which they can privately signal, thereby remaining inconspicuous to predators. Contrast (or more precisely Michelson-contrast) is defined as the difference in luminance between two stimulus areas, divided by the sum of luminance of the two. Contrast sensitivity is the inverse of the smallest contrast that can be detected; a contrast sensitivity of 100 means that the smallest contrast that can be detected is 1%. Birds have comparably lower contrast sensitivity than mammals. Humans have been shown to detect contrasts as low as 0.5 to 1% whereas most birds tested require ca. 10% contrast to show a behavioural response. Birds can resolve rapid movements better than humans, for whom flickering at a rate greater than 50 light pulse cycles per second appears as continuous movement. Humans cannot therefore distinguish individual flashes of a fluorescent light bulb oscillating at 60 light pulse cycles per second, but budgerigars and chickens have flicker or light pulse cycles per second thresholds of more than 100 light pulse cycles per second. A Cooper’s hawk can pursue agile prey through woodland and avoid branches and other objects at high speed; to humans such a chase would appear as a blur. Birds can also detect slow moving objects. The movement of the sun and the constellations across the sky is imperceptible to humans, but detected by birds. The ability to detect these movements allows migrating birds to properly orient themselves. To obtain steady images while flying or when perched on a swaying branch, birds hold the head as steady as possible with compensating reflexes. Maintaining a steady image is especially relevant for birds of prey. Because the image can be centered on the deep fovea of only one eye at a time, most falcons when diving use a spiral path to approach their prey after they have locked on to a target individual. The alternative of turning the head for a better view slows down the dive by increasing drag while spiralling does not reduce speeds significantly. 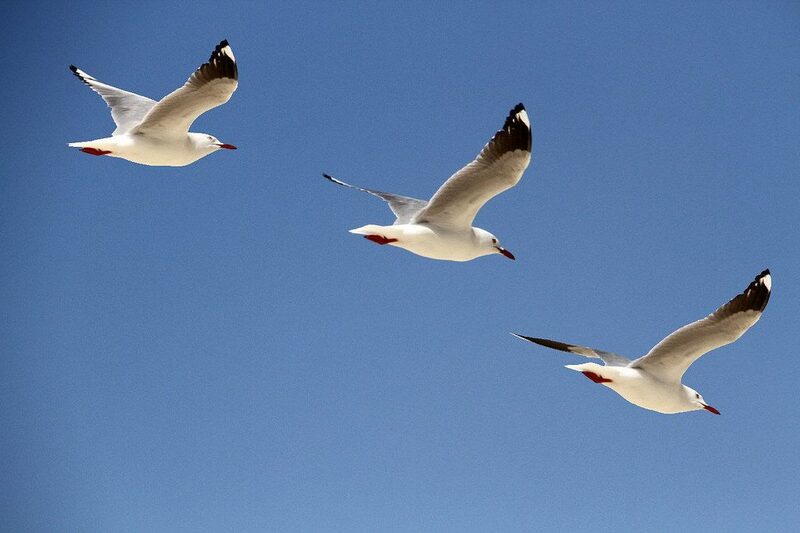 The perception of magnetic fields by migratory birds has been suggested to be light dependent. Birds move their head to detect the orientation of the magnetic field, and studies on the neural pathways have suggested that birds may be able to “see” the magnetic fields. The right eye of a migratory bird contains photoreceptive proteins called cryptochromes. Light excites these molecules to produce unpaired electrons that interact with the Earth’s magnetic field, thus providing directional information. 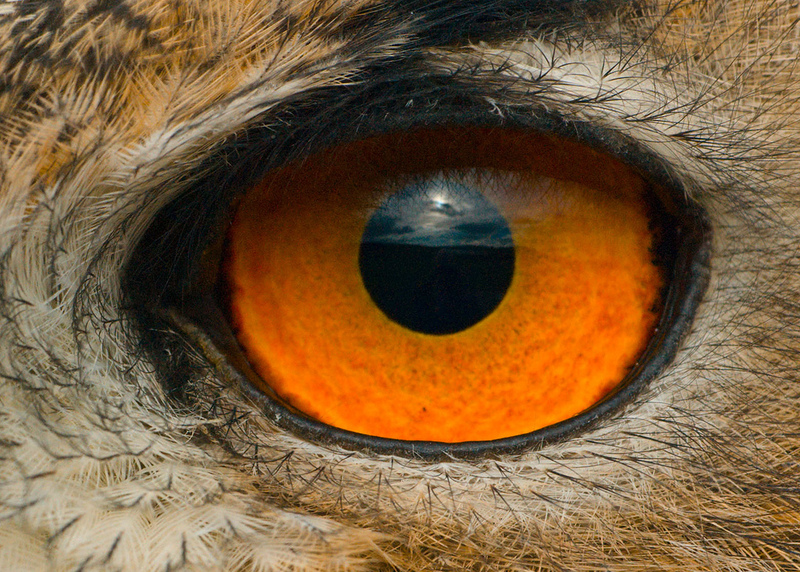 The visual ability of birds of prey is legendary, and the keenness of their eyesight is due to a variety of factors. Raptors have large eyes for their size, 1.4 times greater than the average for birds of the same weight, and the eye is tube-shaped to produce a larger retinal image. The resolving power of an eye depends both on the optics, large eyes with large appertures suffers less from diffraction and can have larger retinal images due to a long focal length, and on the density of receptor spacing. The retina has a large number of receptors per square millimeter, which determines the degree of visual acuity. The more receptors an animal has, the higher its ability to distinguish individual objects at a distance, especially when, as in raptors, each receptor is typically attached to a single ganglion. Many raptors have fove as with far more rods and cones than the human fovea (65,000/mm2 in American kestrel, 38,000/mm2 in humans) and this provides these birds with spectacular long distance vision. 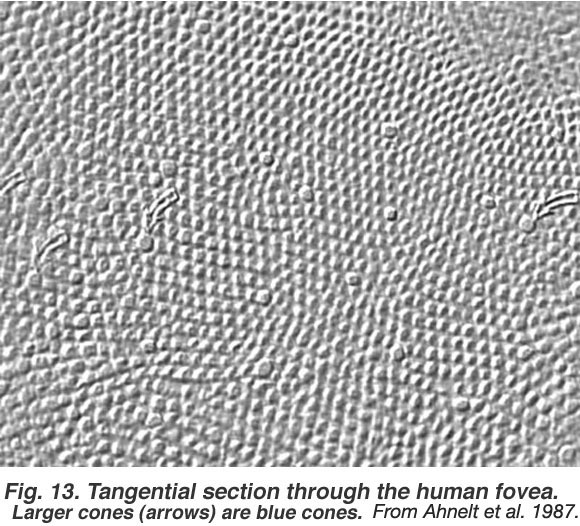 It is proposed that the shape of the deep central fovea of raptors can create a telephoto optical system, increasing the size of the retinal image in the fovea and thereby increasing the spatial resolution. Behavioural studies show that some large eyed raptors (Wedge-tailed eagle, Old world vultures) and have ca 2 times higher spatial resolution than humans, but many medium and small sized raptors have comparable or lower spatial resolution. The forward-facing eyes of a bird of prey give binocular vision, which is assisted by a double fovea. The raptor’s adaptations for optimum visual resolution (an American kestrel can see a 2–mm insect from the top of an 18–m tree) has a disadvantage in that its vision is poor in low light level, and it must roost at night. Raptors may have to pursue mobile prey in the lower part of their visual field, and therefore do not have the lower field myopia adaptation demonstrated by many other birds. Scavenging birds like vultures do not need such sharp vision, so a condor has only a single fovea with about 35,000 receptors mm2. Vultures, however have high physiological activity of many important enzymes to suit their distant clarity of vision. Like other birds investigated raptors do also have coloured oil droplets in their cones. The generally brown, grey and white plumage of this group, and the absence of colour displays in courtship suggests that colour is relatively unimportant to these birds. In most raptors a prominent eye ridge and its feathers extends above and in front of the eye. This “eyebrow” gives birds of prey their distinctive stare. The ridge physically protects the eye from wind, dust, and debris and shields it from excessive glare. The osprey lacks this ridge, although the arrangement of the feathers above its eyes serves a similar function; it also possesses dark feathers in front of the eye which probably serve to reduce the glare from the water surface when the bird is hunting for its staple diet of fish. Owls have very large eyes for their size, 2.2 times greater than the average for birds of the same weight, and positioned at the front of the head. The eyes have a field overlap of 50–70%, giving better binocular vision than for diurnal birds of prey (overlap 30–50%). 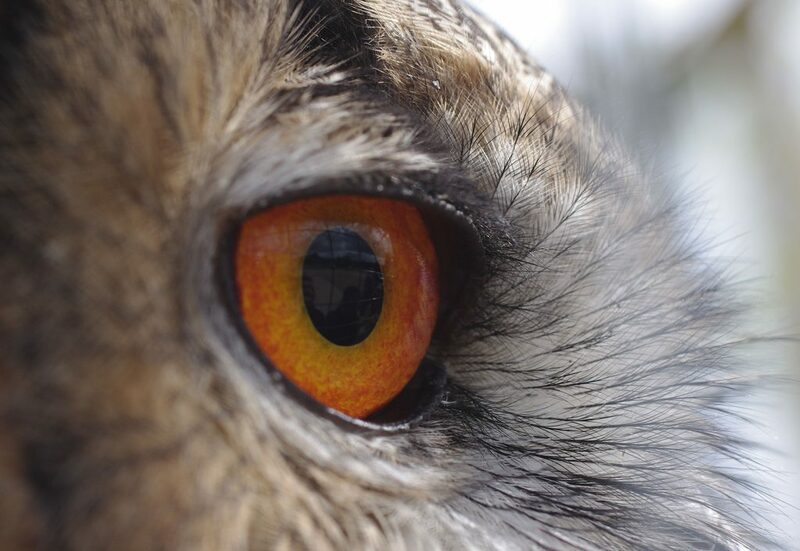 The tawny owl’s retina has about 56,000 light-sensitive rods per square millimetre (36 million per square inch); although earlier claims that it could see in the infrared part of the spectrum have been dismissed. Adaptations to night vision include the large size of the eye, its tubular shape, large numbers of closely packed retinal rods, and an absence of cones, since cone cells are not sensitive enough for a low-photon nighttime environment. There are few coloured oil droplets, which would reduce the light intensity, but the retina contains a reflective layer, the tapetum lucidum. This increases the amount of light each photosensitive cell receives, allowing the bird to see better in low light conditions. Owls normally have only one fovea, and that is poorly developed except in diurnal hunters like the short-eared owl. Besides owls, bat hawks, frogmouths and nightjars also display good night vision. Some bird species nest deep in cave systems which are too dark for vision, and find their way to the nest with a simple form of echolocation. The oilbird is the only nocturnal bird to echolocate, but several Aerodramus swiftlets also utilise this technique, with one species, Atiu swiftlet, also using echolocation outside its caves. 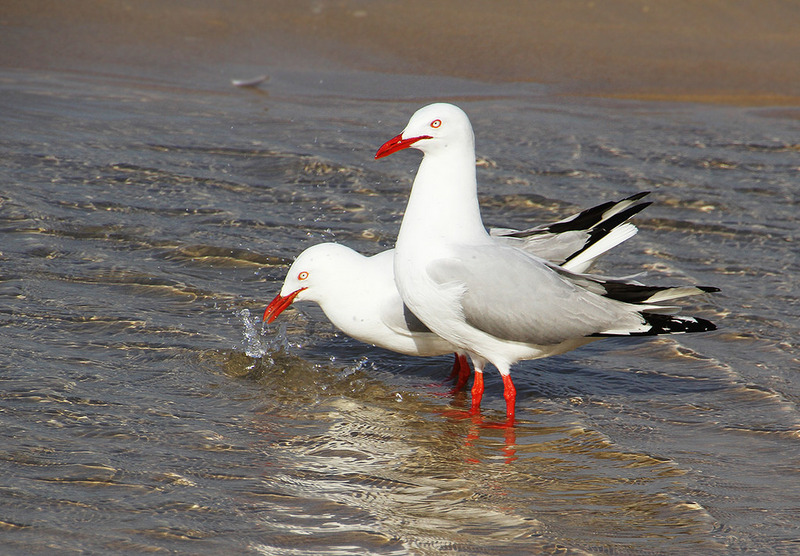 Seabirds such as terns and gulls that feed at the surface or plunge for food have red oil droplets in the cones of their retinas. This improves contrast and sharpens distance vision, especially in hazy conditions. Birds that have to look through an air/water interface have more deeply coloured carotenoid pigments in the oil droplets than other species. This helps them to locate shoals of fish, although it is uncertain whether they are sighting the phytoplankton on which the fish feed, or other feeding birds. Birds that fish by stealth from above the water have to correct for refraction particularly when the fish are observed at an angle. Reef herons and little egrets appear to be able to make the corrections needed when capturing fish and are more successful in catching fish when strikes are made at an acute angle and this higher success may be due to the inability of the fish to detect their predators. Other studies indicate that egrets work within a preferred angle of strike and that the probability of misses increase when the angle becomes too far from the vertical leading to an increased difference between the apparent and real depth of prey. Birds that pursue fish under water like auks and divers have far fewer red oil droplets, but they have special flexible lenses and use the nictitating membrane as an additional lens. This allows greater optical accommodation for good vision in air and water. 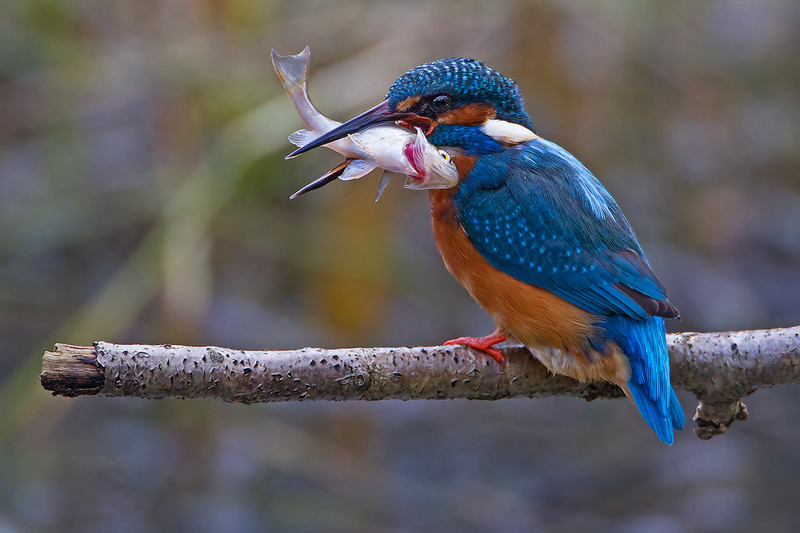 Cormorants have a greater range of visual accommodation, at 50 dioptres, than any other bird, but the kingfishers are considered to have the best all-round (air and water) vision. It used to be thought that penguins were far-sighted on land. Although the cornea is flat and adapted to swimming underwater, the lens is very strong and can compensate for the reduced corneal focusing when out of water. Almost the opposite solution is used by the hooded merganser which can bulge part of the lens through the iris when submerged. In adult humans, the entire retina is approximately 72% of a sphere about 22 mm in diameter. The entire retina contains about 7 million cones and 75 to 150 million rods. What is the highest resolution humans can distinguish? 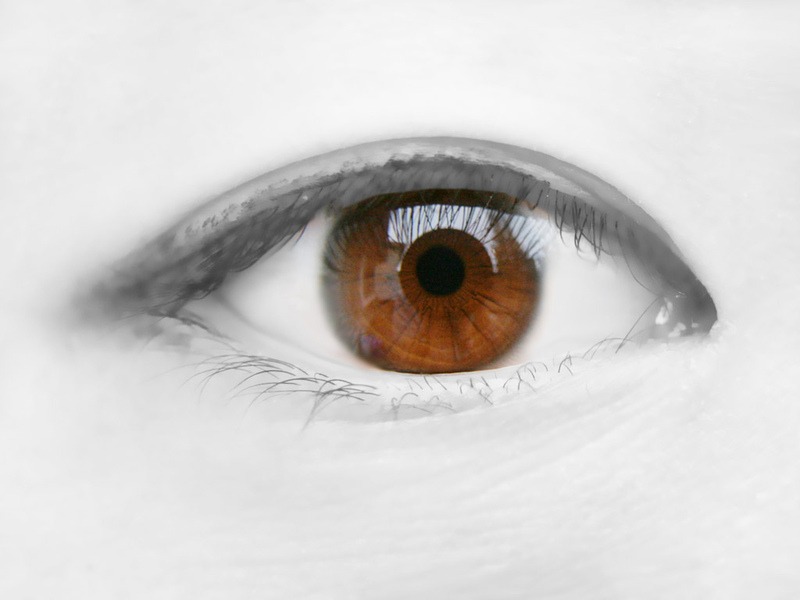 The visual resolution of the human eye is about 1 arc minute. At a viewing distance of 20″, that translates to about 170 dpi (or pixels-per-inch / PPI), which equals a dot pitch of around 0.14 mm. LCD monitors today have a dot pitch of .18mm to .24mm. A 30″ monitor with a 16:9 aspect ratio would be sized around 26″ x 15″. To achieve 170 dpi, it would need a resolution of 4,400 x 2,600 pixels [a MacBook Retina display is 2880 x 1880]. If you want to lean in closer, say to 10″, and still not see the pixels, then you would need to double that resolution. 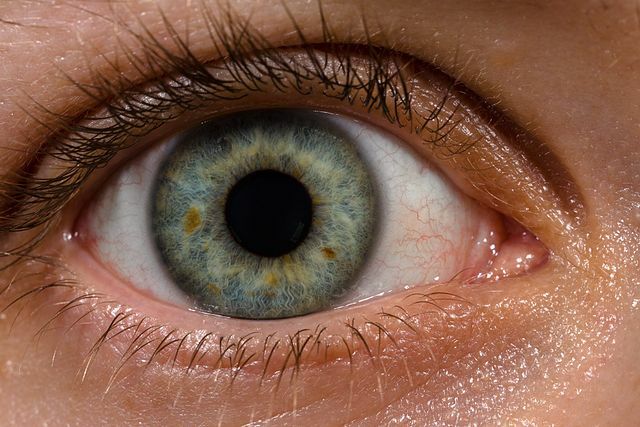 According to scientist and photographer Dr. Roger Clark, the resolution of the human eye is 576 megapixels. That’s huge when you compare it to the 12 megapixels of an iPhone 7’s camera. But what does this mean, really? Is the human eye really analogous to a camera? A 576-megapixel resolution means that in order to create a screen with a picture so sharp and clear that you can’t distinguish the individual pixels, you would have to pack 576 million pixels into an area the size of your field of view. To get to his number, Dr. Clark assumed optimal visual acuity across the field of view; that is, it assumes that your eyes are moving around the scene before you. But in a single snapshot-length glance, the resolution drops to a fraction of that: around 5–15 megapixels. 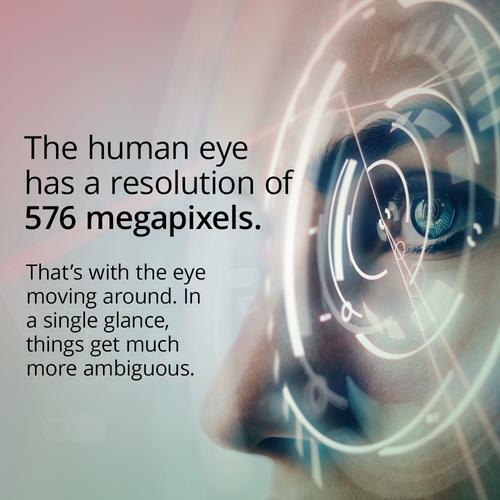 What Is The Resolution Of The Human Eye In Megapixels? What is the resolution of the human eye in megapixels? Well, it wouldn’t directly match a real-world camera … but read on. On most digital cameras, you have orthogonal pixels: they’re in the same distribution across the sensor (in fact, a nearly perfect grid), and there’s a filter (usually the “Bayer” filter, named after Bryce Bayer, the scientist who came up with the usual color array) that delivers red, green, and blue pixels. So, for the eye, imagine a sensor with a huge number of pixels, about 120 million. There’s a higher density of pixels in the center of the sensor, and only about 6 million of those sensors are filtered to enable color sensitivity. And of course, only about 100,000 sense for blue! Oh, and by the way, this sensor isn’t made flat, but in fact, semi-spherical, so that a very simple lens can be used without distortions; real camera lenses have to project onto a flat surface, which is less natural given the spherical nature of a simple lens (in fact, better lenses usually contain a few aspherical elements). This is about 22mm diagonal on the average, just a bit larger than a micro four-thirds sensor, but the spherical nature means the surface area is around 1100mm^2, a bit larger than a full-frame 35mm camera sensor. The highest pixel resolution on a 35mm sensor is on the Canon 5Ds, which stuffs 50.6Mpixels into about 860 mm². So that’s the hardware. But that’s not the limiting factor on effective resolution. The eye seems to see “continuously,” but it’s cyclical, there’s kind of a frame rate that’s really fast, but that’s not the important one. The eye is in constant motion from ocular microtremors that occur at around 70-110Hz. Your brain is constantly integrating the output of your eye as it’s moving around into the image you actually perceive, and the result is that, unless something’s moving too fast, you get an effective resolution boost from 120MP to something more like 480MP as the image is constructed from multiple samples. Which makes perfect sense—our brains can do this kind of problem as a parallel processor with performance comparable to the fastest supercomputers we have today. When we perceive an image, there’s this low-level image processing, plus specialized processes that work on higher level abstractions. For example, we humans are really good at recognizing horizontal and vertical lines, while our friendly frog neighbors have specialized processing in their relatively simple brains looking for a small object flying across the visual field: that fly he just ate. We also do constant pattern matching of what we see back to our memories of things. So we don’t just see an object, we instantly recognize an object and call up a whole library of information on that thing we just saw. Another interesting aspect of our in-brain image processing is that we don’t demand any particular resolution. As our eyes age and we can’t see as well, our effective resolution drops, and yet, we adapt. In a relatively short term, we adapt to what the eye can actually see, and you can experience this at home. If you’re old enough to have spent lots of time in front of Standard Definition television, you have already experienced this. Your brain adapted to the fairly terrible quality of NTSC television (or the slightly less terrible but still bad quality of PAL television), and then perhaps jumped to VHS, which was even worse than what you could get via broadcast. When digital started, between VideoCD and early DVRs like the TiVo, the quality was really terrible, but if you watched lots of it, you stopped noticing the quality over time if you didn’t dwell on it. An HDTV viewer of today, going back to those old media, will be really disappointed, and mostly because their brain moved on to the better video experience and dropped those bad-TV adaptations over time. Back to the multi-sampled image for a second; cameras do this. In low light, many cameras today have the ability to average several different photos on the fly, which boosts the signal and cuts down on noise; your brain does this, too, in the dark. We’re even doing the “microtremor” thing in cameras. The recent Olympus OM-D E-M5 Mark II has a “hires” mode that takes eight shots with 1/2 pixel adjustment, to deliver what’s essentially two 16MP images in full RGB (because full pixel steps ensure every pixel is sampled at R, G, B, G), one offset by 1/2 pixel from the other. Interpolating these interstitial images as a normal pixel grid delivers 64MP, but the effective resolution is more like 40MP, still a big jump up from 16MP. Hasselblad showed a similar thing in 2013 that delivered a 200MP capture, and Pentax is also releasing a camera with something like this built-in. We’re doing simple versions of the higher-level brain functions, too, in our cameras. All kinds of current-model cameras can do face recognition and tracking, follow-focus, etc. They’re nowhere near as good at it as our eye/brain combination, but they do ok for such weak hardware. Source: This question originally appeared on Quora.